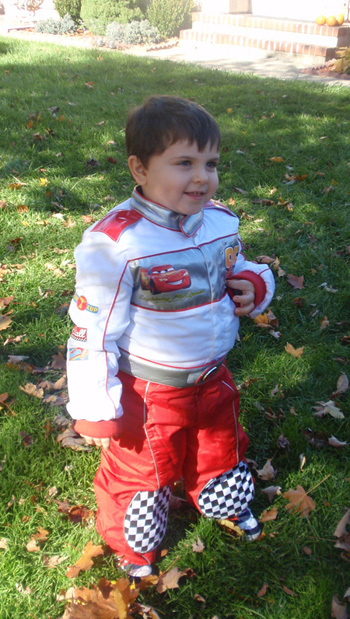 Nicholas had a great Halloween….. If today isn’t proof that what I’m doing is working, then I don’t know what is. Two weeks ago, Nicholas did not care what Halloween was. Two weeks ago, he didn’t know that he already had a costume hanging in his closet waiting for him to wear. Two weeks ago, he had no idea what “trick or treat” meant – and he had never uttered the words before… ever. A few months ago, we would have never been able to take a walk around our neighborhood like we did tonight. As a matter of fact, the last time I took a walk around my neighborhood was with Nicholas in a stroller way before he turned one. A few weeks ago, we started talking about Halloween – and obviously, so was school. Nicholas brought home a glue and stamp project last week and when I pulled it out of his backpack, he said Halloween. He knew what the ghosts were and pointed them out. He pointed out the bats – and was blissfully happy looking at his Halloween picture – as he proudly uttered “Happy Halloween!” One night last week when his grandparents were visiting, I told Grandma to go show Nicholas the picture knowing they had never heard him say the word – he proudly said, “halloween!” and was instantly excited. giggling. happy. Still, I had no plans of trick or treating. The idea hadn’t even entered my mind. What would the purpose be? He doesn’t really get Halloween, right? We head to school for the big parade and watched as Nicholas was the first one in line to march. He was very cute, very serious marching around with his one of his aides whom I know he adores. Later, he headed to Nicholas’s classroom to pick him up and sign him out to go home. He was very cute posing for pictures in the hallway – and showing us his artwork hanging outside of his classroom. When we got home, the costume came off quickly and we figured we were done for the day. Then the doorbell started ringing and kids were there in costume saying “trick or treat” and we were giving them candy. A couple of hours goes by and Nicholas is getting more and more interested in what was going on. He was now coming to the door saying Happy Halloween to everyone who rang the bell. So, we got him back in his costume – with no fight other than him playing the tickle-feet-sock game he loves to play with us. And we left the house. Still, I’m thinking that this is going to be a short lived trip, that we would hit our one neighbor’s house and that would be it. So, we ring the neighbor’s doorbell – and he comes to the door. Nicholas promptly says “trick or treat” and holds out his pumpkin candy basket. After he got his treat, he says “Happy Halloween, bye!” and we left. So we start walking around the neighborhood to house after house. Nicholas was walking up the path to one house after another and another. He was doing it. He was trick or treating. We did not have to drag him. There were no threats of going to bed early. (This works with him for some reason) There was just happiness, fun and trick or treating. No temper tantrums. No crying. No shyness. Nothing. We walked around for quite some time – down one street then around to another. Nicholas’s pumpkin was now full, but we kept going. I finally asked Nicholas if he was all done and he said “yes, go home” – so we turned around and walked home. When we got home, I asked him if he wanted to go to one more house. He said, “yes” so we went to one more house and then walked home once again. So, we’re home and the doorbell is ringing and ringing and with each ring, Nicholas gets up and wishes each kid a Happy Halloween. You’re right baby, it was a Happy Halloween and this Mommy could not have been more proud. « New Jersey and Autism Perfect Together! 🙂 what a great story!!! He’s so cute! Last year, my Nate threw a tantrum, didn’t want to put on his outfit, and was ok with opening/closing the door every time the door bell rang at home. (the OCD in him loved opening/closing doors). I stayed home with him and my husband took our older boy house-to-house. This year he was right there by his brother’s side, and he didn’t even want to walk with me. He took my hand maybe once or twice, but it was more about being next to Jake. When we got home, I traded their candy for toys they both wanted. Jake got to keep about 10 pieces, Nate has a stash of organic lollipops in the pantry. The candy is hidden and will go to the office on Monday to fatten up my coworkers. Thank you!! That is awesome!! !